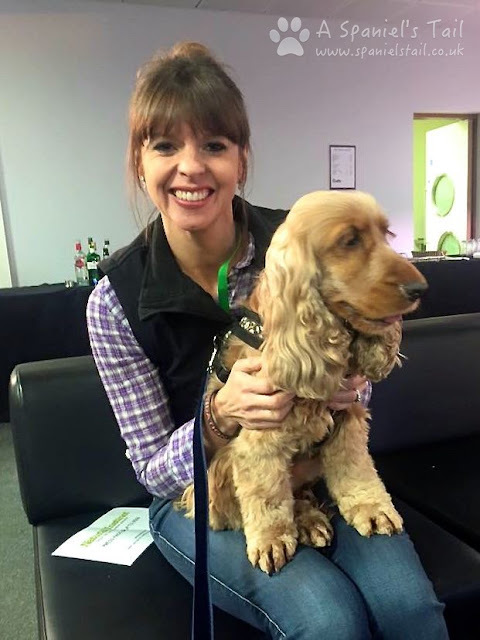 For the third year in a row, we are thrilled to be going back to Crufts this year! And to celebrate, we have been kindly given a pair of tickets by the Kennel Club for a giveaway. These tickets can be used on a day of your choice - the only restriction is the Best In Show on the Sunday evening. Crufts is taking place this year on the 9-12th March - and as usual, it will be at the National Exhibition Centre in Birmingham. 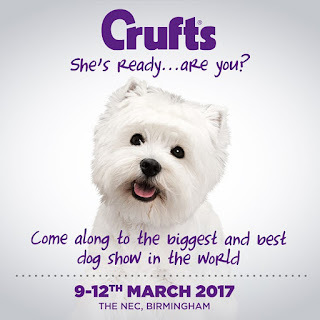 For more information on the event, and to buy tickets, visit the Crufts website. Crufts is a huge event, and there is all sorts to appeal to all visitors! Dog Activities Display Ring where you can learn about how to get involved in all the many great fun dog activities such as agility, gundog training, rally, and so much more. So has that whetted your appetite? We will be attending as usual on Gundog day, which is Saturday 11th March this year - do stop us to say hello if you see us! Hooman will be the harrassed looking woman with an overexcited cocky spangle in one hand, and a camera in the other. 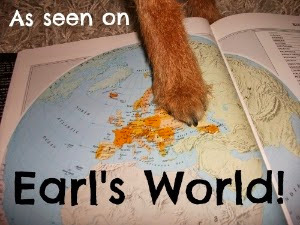 Mostly to be found around the Cocker Spaniel showing rings! Last year we were super lucky to meet Victoria Stilwell in the press office! Given that I hugely embarrassed the Hooman by grubbing around on the floor for dropped Tuna pasta, she was absolutely lovely and posed for a photo for us. The competition is a raffle style entry at the bottom of this post - the only mandatory entry is to provide an email address for our mailing list (we would ask that people please play fair - sometimes people don't, which just causes so much more work for us as we do verify them), but then you can gain extra "entries' by getting involved on our Instagram / Twitter / Facebook pages, or even just commenting below! This will run till midnight Friday, to give us plenty of time to get them posted out. Unfortunately this competition is only valid for UK entries. Stock up on essentials like worming tablets & Thornit. Then check out the stands for toys bedding & new collars. Hopefully then I will have time to check out the Obedience & agility rings. Peruse the stalls looking for books and brainteaser toys, watch my friend's dog being shown, talk to the people in the Discover Dogs area about Polish Lowlands and Havanese to decide whether I might add one to our family, watch some agility and HTM, spend more money then stagger back to the car hoping that at least one of us can remember where we left it. I'd take my daughter to look at all of the beautiful dogs. We went years ago and had a fab time. I'd love to share it with my little girl. I enjoy the enthusiasm and general happiness of Crufts with people sharing their love of all the different breeds. I would like to visit the breeders stands to talk to owners and visit the arena to watch the agility shows. On my to do list would be some shopping for my little girl (puppy) and because I've seen on telly all the wonderful stalls they have. To learn maybe some tips and tricks on training and getting the most out of my relationship with my pup. I'd also love meeting all the dogs around the show, and watching them compete in the rings! Especially the agility shows. ...I'll also enjoy having a little chuckle inside at some of the more "fancy" breeds! Panicking because I can't work out how to subscribe, please don't discount my entry because I will sub as soon as I've worked out how/you've told me!!!! !